Ask any new parent about the best toy/baby device that they can't live without and they will immediately say that it's a baby jumper! I can't tell you how many times a baby jumper came to my rescue when my daughter was cranky, and I had almost given up. Trust me, no matter how cranky your baby is, once you put him/her in that comforting jumper, they are all smiley and giggly. I can just watch my daughter bounce up and down on her jumper all day long! Now, as great as baby jumpers are, not all of them are perfect, at least not for everyone. 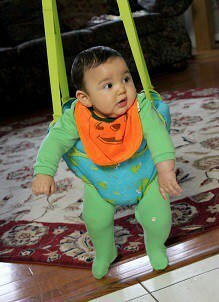 While most of the baby jumpers can be installed right in your living room, they usually are bulky and can take up a lot of space. If you live in a small apartment and you already have a crib or an activity center for your baby, getting a traditional jumper will only add to the clutter. What you need is a jumper that will take up less space and yet entertain your baby. Thankfully, some jumpers are designed to do just that. I am, of course, talking about doorway jumpers. As the name implies, these jumpers are designed to be attached to any existing door frame in your house with a sturdy clamp. They are small and compact and occupy very little space. One of the best things about doorway jumpers is the fact that they can be stored quite easily as well when your baby is done using them. So, should you get one? In a word, absolutely. If you have a small apartment or just want to keep the clutter down, a doorway jumper is an excellent alternative to a big activity center. There are a ton of great doorway jumpers out there, and while some of them are great, a lot of them are just not worth your time and money. They all look so similar that if you don't know what to look for, it can get confusing, and you can end up buying a jumper that is just not worth it. Let's remedy that situation, shall we? What to look for in a doorway jumper? Buying a doorway jumper can be relatively easy if you know what to look for while selecting one. Let's take a closer look at some of the features that you should check out before purchasing a doorway jumper. One of the most important things to look for in a doorway jumper is the build quality and safety of the device. Your baby is going to be suspended in the device and will jump around. So, naturally, you want a device that is built with highest safety standards. All the material that is used in the construction of the jumper needs to be of the highest quality including the clamp used to secure it to the doorway. While most manufacturers do an excellent job in selecting the material of construction for these jumpers, some manufacturers are known to do a less than an impressive job. Stay away from such jumpers at all cost. The suspension straps are responsible for the bouncing action that happens in a doorway jumper. Make sure that you are getting a jumper that has more than one suspension trap. The more suspension straps, the better, If there are only one or two straps, the bounce can be uneven and not properly balanced. On the contrary, if you have multiple straps, the baby can bounce with more control, and there are fewer chances of any uncontrolled wobbling. The comfort of your baby is of utmost importance. If the baby is not comfortable, chances are, he/she will not enjoy the experience, and a doorway jumper will be a giant waste of money. So, make sure that the jumper you are selecting is very comfortable for the baby. Most jumpers are designed to provide adequate support and padding. While some jumper seats are removable and washable, some others are not. Some are made using high-quality foam material while others can be made from cheap plastic. Just make sure that the jumper that you are picking out has enough padding to support your precious baby while he/she is busy jumping around in one. Anything that a baby uses to play with or play on is potentially a source of infection. I can't tell you how many times I have seen my daughter licking and gnawing on the belts and harnesses of her doorway jumper. So, it is important that the jumper that you are buying can be cleaned easily. Some of the manufacturers do a fantastic job at making their jumpers easily cleanable. Detachable seats that you can throw in a washing machine can make your life a lot easy, trust me. The material used in the construction of the seats also can make them easy or difficult to clean. I have a doorway jumper that is such an easy device to clean that I absolutely love it. All I need to do is wipe it down with a disinfectant wipe and boom; it's all cleaned up! One of the most important reasons that you want to purchase a doorway jumper is that you don't have a lot of space in your apartment. So, if a doorway jumper takes a lot of space for storage, then it is of no use. You might as well get an activity center in that case, right? While most manufacturers seem to understand this and they have designed their doorway jumpers accordingly, some others haven't. Make sure that the baby jumper that you are selecting is easy to store, depending on your storage needs. Most doorway jumpers have a weight limit associated with them. Make sure that you are purchasing a jumper that will allow your baby to use it as he/she grows. Some manufacturers can be a bit sneaky about advertising the weight limits on their jumpers. Make sure that you understand the weight limits of the jumper that you are selecting. I would suggest you go for a jumper that has a wider range of weight limit than the one with a narrower range. Cost is also an important factor to consider while purchasing a doorway jumper. I always say that you get what you pay for, especially in the case of baby products. While there are some 'budget' doorway jumpers out there, some of them sacrifice a lot of quality to keep the cost down. I would strongly suggest staying away from the super cheap doorway jumpers as they tend to break easily and just aren't worth the money. That said, I would also strongly suggest that there is no point in overspending on a jumper if it does not offer the returns regarding quality, longevity, and comfort. So, staying in the middle of the road is probably the best advice that I can give you. Besides, the doorway jumpers that I review in the following sections were chosen because they strike the right balance regarding cost and return. So, if you want to avoid making that decision, just select one from the list below, and you won't go wrong. Although doorway jumpers are quite safe to use, there are some things that you should keep in mind regarding using them safely. Here are some of the tips that you may find useful while using a doorway jumper. Make sure that you are picking the right door frame to install a doorway jumper. Read all the instructions that come with your jumper and use a door frame that meets all the required specifications. Remember that not all door frames will be suitable for a doorway jumper. 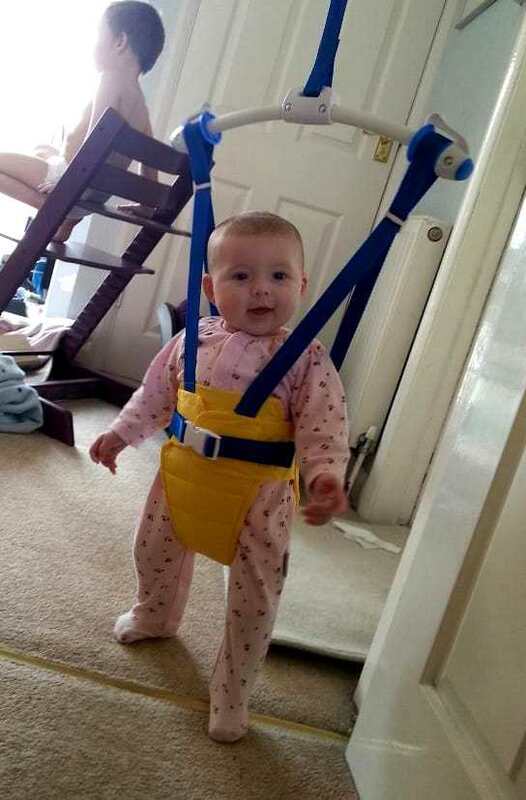 You can easily adjust the height of a doorway jumper for your baby. 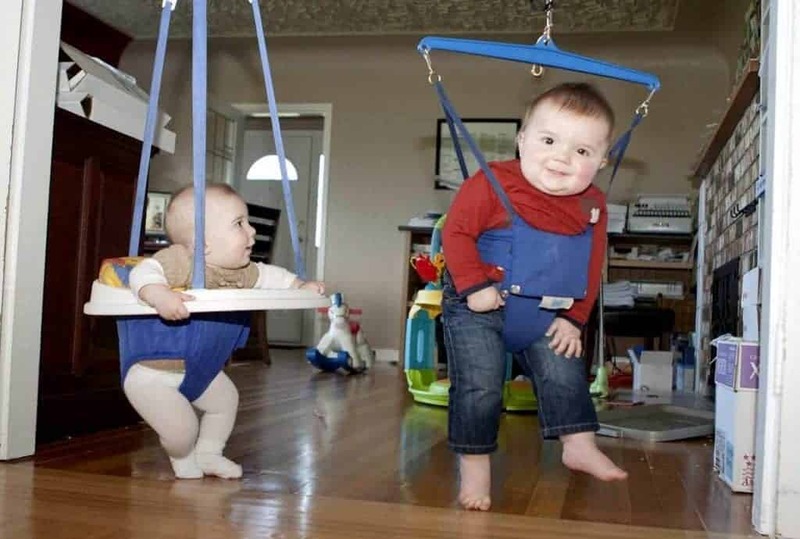 Make sure that you are adjusting the height that allows your baby to bounce safely. Make sure that you inspect the jumper for any signs of wear and tear before putting your baby in it. Make sure that you don't leave your baby unattended when he/she is in the jumper. Don't keep the doorway jumper suspended when the baby is not using it. The doorway jumper is not a swing. Don't push the baby as if the jumper were a swing. Lastly, limit the time for which the baby uses the jumper. I personally don't let my daughter use her jumper for more than 15 minutes at a time. Also, a door jumper should not be your go-to solution for whenever your baby cries. Babies need a lot of other forms of exercises such as tummy time, crawling and creeping exercises. A jumper is not an alternative to these by any means. So, now that we know how to pick the best doorway jumper, let's take a closer look at some of the best doorway jumpers that you can buy. One of my favorite doorway jumper, the Bumper Jumper by Graco is one of the most beautiful doorway jumpers out there. Apart from the great design, the Bumper Jumper offers some solid support and comfort for the baby. One of the best features of this jumper is the build quality. All the material including the clamp, the fabric on the seat and the seat itself seems to be carefully selected. You don't get the feeling of cheap plastic material that is quite common with some other jumpers at this price point. 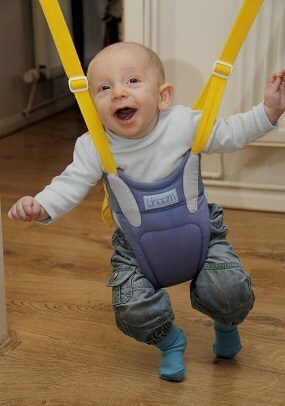 The bounce spring on this jumper is quite sturdy and allows a controlled bounce for enhanced safety. There is also a hidden safety cord underneath the spring for an extra layer of security. I especially love the clamp that is used in the jumper. One of the biggest problems using a doorway jumper is that the clamps often leave a mark on the top of your doorway. The Bumper Jumper takes care of that. The Clamp is padded so that it will not leave any marks on your expensive door frame; good job! There are also a couple of plush toys attached to the straps of the jumper that is, of course, a welcome addition. I have no problems recommending this bouncer. It is a quality product that offers an excellent value. I don't have any major issues with this doorway jumper at all. Although if I am nitpicking, I would have loved to see a darker color that won't stain as easily as the white ones they have now. Evenflo Exersaucer is perhaps one of the most well-known activity center and jumper brands out there. They have been in the market for an eternity, and it shows in their every product. The Door Jumper is no exception. It is a very well-made product that is simply put, one of the best doorway jumper that you can buy. It is a simple design that allows the baby to jump up and down with comfort. The dual elastic straps are made from quality material that can handle up to 24 pounds. So, there is plenty of room for your young one to grow with this doorway jumper. The door clamp is designed with a 100% stainless steel material and is easy to clamp on any standard doorway. Another great feature of this jumper is the seat. There is plenty of padding in this seat, and it is designed so that it will not cause any rashes during use. The jumper is easy to clean as well. You can just throw it in a washer to get it clean. It is as simple as that. It is available in multiple colors and patterns. You are sure to find one that you like. I have no hesitation in recommending this jumper whatsoever. It is a great product that is worth your time and money. The only problem with this jumper is that it can be a bit difficult to get your baby in and out due to the thick padding on the seat. Although after a couple of times of use, it gets a bit easier. If you are looking for a minimalistic doorway jumper then don't look any further, The Jolly Jumper is one of the simplest jumpers on the market that has a minimalistic design and an excellent build quality. The material used in the construction of this jumper is simply excellent. The door clamp and the spring are made out of 100% stainless steel that has high tensile strength. The seat and the suspension straps are made from a high-quality fabric that allows for easy cleaning and storing as well. The jumper fits most standard doorways with ease, and it is quite easy to set up as well. The unique design of this jumper allows the baby to fully explore the surroundings as there are no trays or anything like that in the way. On the downside, there is no place for any toy on the jumper at all. While it may not be a big issue with many parents, it can be a problem for some others. The overall quality and usability of this product are simply awesome. I do recommend this product, but just keep in mind that it has a rather minimalistic design. If you are looking for a versatile doorway jumper, then the Bright Stars is the one for you. It is a great little jumper that packs in a surprising amount of accessories for a doorway jumper. One of the best things about this jumper is the quality. It is a really well-made jumper with great attention to detail. The clamp and the seat are sturdy and made from quality material. I also love the fact that the jumper comes in various patterns and colors. Another great thing about this jumper is that it comes with some soft toys attached to it. There are a couple of rattles as well attached to the straps that will keep your baby entertained while he/she bounces away. It is a comfortable jumper as well. The seat has enough padding, and the straps don't get in the baby's way as well. Overall, it is an excellent jumper, and if you are looking for a doorway jumper that comes as close to a full blown activity center, then this one deserves a chance! When it comes to baby toys and activity centers, Baby Einstein is a huge name. I have been using their toys for quite some time, and when I came across their doorway jumper, I had some high hopes. As expected, the Baby Einstein Door jumper is a quality product that is designed with the same diligence as their other baby products. The secure clamp can be attached to almost any standard door frame and if quite sturdy as well. The jumper can withstand up to 25 pounds of weight, and the spring is just hard enough to allow for a controlled bounce. One of the highlights of this jumper is the fact that it has some soft toys attached to it. The toys can be removed and repositioned as well. The toys include a rattle, some flash cards (in three languages) and some plush toys. The jumper is also quite comfortable for your baby as well. The seat is nicely padded and does not snag at the baby. I was also impressed by the fact that it is quite an easy jumper to carry with you. It weighs less than a standard laptop, and you can throw it right in a tote bag and bring it with you. Overall, it is an excellent product, and I highly recommend checking it out. After reviewing some of the best doorway jumpers on the market, the one jumper that stood apart is the Graco Bumper Jumper. It offers an excellent value for your money and is built to last for a long time. I loved the clamp that leaves no scuffing marks on the doorway as well. I also love how easy it is to set this jumper up and carry it with you. The seat is beautiful and comfortable and it is super-affordable. Overall, I just love this jumper, and if you are looking for one, you can't go wrong with the Graco Bumper Jumper! If you liked the article, please don't forget to share it with your friends. I would love to hear from you about your experience with a doorway baby jumper!